Need a mixologist? Say no more. Patrón Tequila (‎@Patron), a leading spirits brand, was looking for new ways to reach the elusive legal drinking age (LDA) millennial audience and showcase its versatility in cocktail trends and recipes around the world. People on Twitter in particular have a discovery mindset and are accustomed to engaging with brands. With this in mind, Patrón created the “Bot-Tender” — a chatbot spin-off of the “bartender” that exists in Patrón’s Direct Messages with all of the cocktail prowess of a real mixologist. Based on the occasion (pool party or cookout), flavors, or ingredients selected, the chatbot served up summer cocktail recommendations tailored to the consumer’s preferences. By providing consumers with opportunities for personalized, one-on-one conversations with the brand, the Bot-Tender offered deeper engagement than traditional tactics. From there, Patrón wanted to bring awareness of its chatbot to a wider audience. Patrón used the Direct Message Card to drive awareness of its chatbot among its hard-to-reach LDA millennial audience. The Direct Message Card is an ad format with customizable calls to action that can lead consumers into a personalized, one-on-one brand experience with chatbots. Using inviting and visually eye-catching creatives, Patrón grabbed people’s attention and made it easy for consumers to curate the perfect summer cocktail. With instant access to new and existing recipes directly on Twitter, Patrón differentiated its brand through its fun and novel Bot-Tender. Small-batch tequila, #SimplyPerfect tweets. Imported from Mexico by The Patrón Spirits Company. Las Vegas, NV. Must be legal drinking age to follow. Patrón captivated audiences and increased clickthrough rates by creating multiple creatives based on different summer flavors and moods. The campaign also had four occasions as calls to action that led consumers to immediately personalized experiences. Patrón created a fun experience that was unique to its brand. It helped expand the consumer online experience of Patrón while offering consumers real value directly on Twitter. Provide curated access to existing and new recipes. 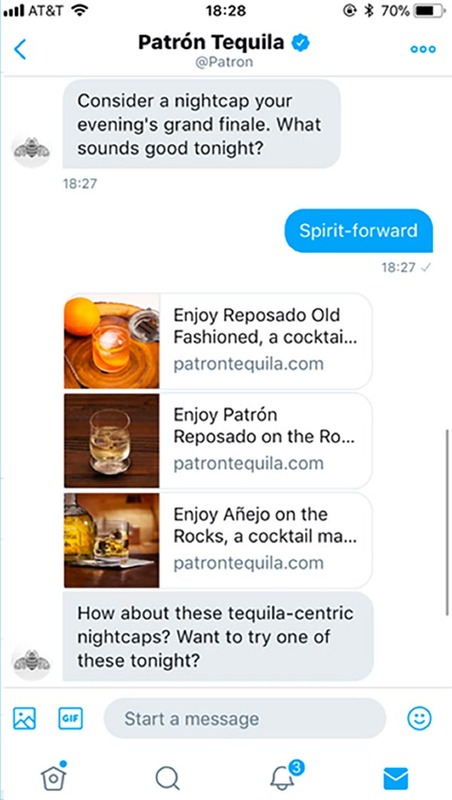 As conversations with Patrón live in Direct Messages, consumers could easily keep track of their favorite recipes and find new ones simply by re-engaging with the chatbot from their Direct Message inbox. Your preferences, coming right up: Promoting the Bot-Tender chatbot using the Direct Message Card was a resounding success that drove awareness and deepened engagement with consumers. Out of everyone who interacted with the Bot-Tender across several different chatbot platforms, 67% of total conversations happened on Twitter. The best-performing Direct Message Card ad garnered an impressive 2.6% clickthrough rate. The number of recipes served by the chatbot exceeded Patrón’s goal by over 2X. 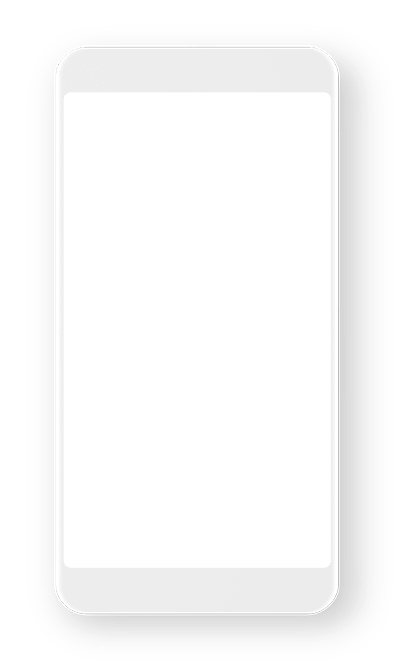 In addition, Patrón saw that 39% of recipes served in Direct Messages led to website views where consumers could go even deeper into Patrón’s content, showing that the chatbot served up increased interest in the brand’s content overall. The launch of the Bot-Tender chatbot and Direct Message Card led to an 11,000% increase in Direct Messages on Twitter since summer 2016. We launched the Bot-Tender to provide fans with a unique way to have more one-on-one conversations with our brand. The Direct Message Card successfully drove awareness of the Bot-Tender. We exceeded our goal for the number of recipes served by more than 2x and increased Direct Messages by 40X per week, on average.